Recycle That eWaste This Weekend! Looking to get rid of those old household electronics including computers, TVs, cameras and speakers, gently-used clothing, old bicycles and even car tires? The head to the mall this weekend! 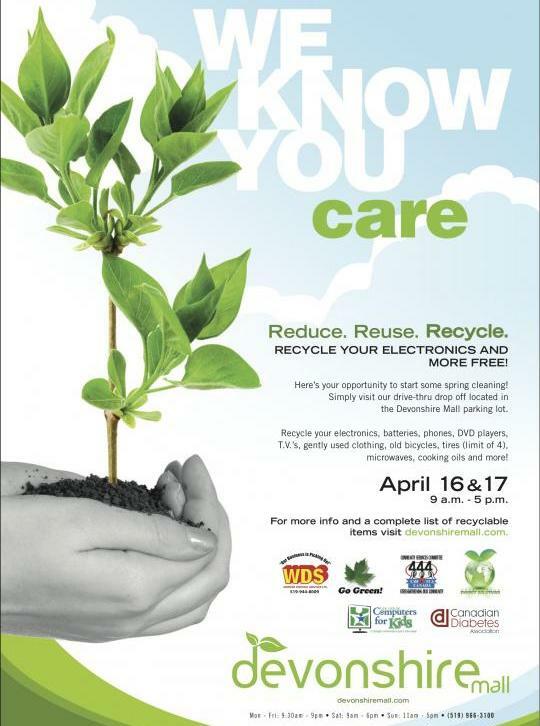 For the fifth straight year, Devonshire Mall is renewing its pledge to the planet and celebrating Earth Day with the centre’s Reduce, Reuse and Recycle event, which includes eWaste Recycling service on April 16 and 17, 2011. With the goal to divert electronic waste from Canadian landfills, Devonshire Mall has collected and safely disposed of nearly 200,000lbs of eWaste to-date. They have also been recognized by Environment Canada for their ongoing efforts. This weekend’s recycling service is free and items collected during the two-day event will be properly recycled or refurbished and donated to community partners including Windsor Disposal Service, Great Lakes Energy Solution, CAW Local 444, Canadian Diabetes Association and Computers for Kids. To help green-minded shoppers conserve time and energy during the busy event, Devonshire Mall has set up a drive-thru drop off area located in the southwest end of the parking lot for shoppers to conveniently hand off recyclables to event staff. For a full list of accepted recyclables visit the malls website!